Clicker Training Rabbits, Ferrets and Pot-Bellied Pigs -- Say What? Clicker Training Rabbits, Potbellied Pigs and Ferrets — Say What? It is well known that you can use clicker training techniques to get dogs to fetch and cats to shake paws on cue. But can you train your ferret to ride a skateboard, your rabbit to hop through weave poles or your potbellied pig to carry a basket of flowers in her mouth? Yes, yes and yes, replies Karen Pryor, Ph.D., a behavioral biologist from Waterford, Mass., who is regarded as one of the top authorities on animal learning and behavior using a clicker. Also agreeing is Laura Bourhenne, a certified dog and exotic animal trainer with Animal Attraction Unlimited in Woodland Hills, Calif.
Clicker training is a positive training technique that relies on operant condition to shape a desired behavior without force or cajoling. The premise is simple: When a pet performs a desired behavior, you mark that action by pressing down on a clicker device and then rewarding your pet with one of her favorite treats. Your pet quickly learns that this sound confirms she has mastered a desired behavior and that a reward is on its way. Step 1.Know your species. Prey animals, such as ferrets and rabbits, tend to be more timid around new items, so you need to build up their trust and confidence. Pigs, Pryor adds, prefer to stop and think about what’s happening before responding. Please don’t mistake their initial hesitation for being stupid, stubborn or not interested. Step 2.Teach tricks they can master. Ferrets, according to Bourhenne, are quick, agile and like to hang out in dark places. They also use their paws quite well, so they can be trained to pick up a small ball and put it through a tiny basket, using a clicker. They can also learn to ride on a skateboard. Rabbits are known for nudging objects with their noses and jumping up on platforms, so you can train them to maneuver a small, lightweight ball in and out of weave poles. And they can hop in a basket on cue. Pigs are quite adept at carrying objects in their mouths, so Pryor suggests clicker training your potbellied pig to pick up a basket of flowers in her mouth. Step 3. Make mini-training sessions fun for you and your pet. Teach your pet to touch or follow a target, such as a wooden spoon or a chopstick. Hold it out, and when your pet moves forward to sniff it, click and give a favorite treat. Limit training sessions to 10 minutes or less. Step 4. Hone your clicker-timing skills. Click the instant your pet touches or sniffs or even looks at the target, and then quickly give her a treat. This sequence encourages pets to work for rewards. Step 5. Practice patience. Just like us, pets, no matter the species, learn at different rates. Emphasize praise when your pet masters a small step, and never get angry or force your pet to move at a speed faster than she can handle. "Almost anything you can teach a dog, you can teach [these nontraditional] types of pets," Pryor says. "Pigs, for example, are not good jumpers, but you can teach them to heel, back up, spin, wave, stay and other things you teach to a dog." 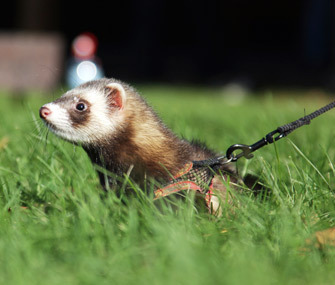 There are a few fun and practical perks of clicker training your ferret, rabbit or pig. Regular training sessions will foster a stronger bond between you and your pet. You get the chance to amaze friends and family members by showing them the cool tricks your critter can perform. On the practical side, a clicker-trained pet is more apt to come when called. This is very useful when a pocket pet has escaped from her cage and you need to find her. You can also use clicker training to have your pet move to a specific place to make it easier for you to clean her cage. Finally, clicker training can teach your pet to be willing to sit still for handling, a plus when you need to trim her nails or have her examined by your veterinarian.